HDe 319718, also known as Pis 24-1, sits in the cluster Pismis 24, at RA 17h24m43.41s & DEC -34°11'56.5" (J2000). Previously classified O4(f), Massey et al. prefer the reclassification O3 If*, O3 representing the hottest class of stars. The reported absolute bolometric magnitude of -11.8 translates into 106.62 = 4,130,000 solar luminosities. They report a mass of 120 solar masses, which is implied by the very high effective temperature of 50,700 K, making this one of the hottest stars on the list, rivaled only by HD93129A. The spectral classification implies that NIII and HeII are seen in emission (that's where the "f" comes from), and NIV emission is stronger than NIII (the "*"). HeI is seen in very broad lines (85mÅ), which is what pushes the star into the extreme O3 spectral class. But the earlier O4(f) classification may reflect a real variation in brightness, especially if HDE 319718 is in fact an LBV star. It is cleary a supergiant star, but no size is reported. Considering its high mass, I would hazard to guess that it extends about 200 solar radii (it is hotter than the Pistol star hot model, but not as bright, so it must be somewhat smaller). The open cluster Pismis 24 is located inside the emission nebula NGC 6357. 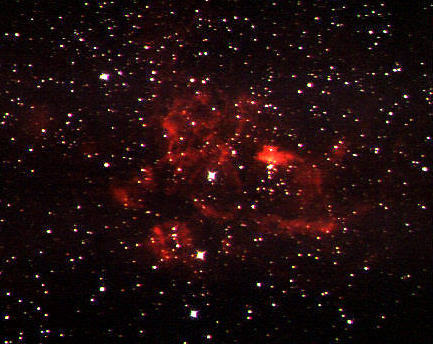 The nebula is diffuse enough not to show up on the Palomar sky survey image in figure 1, but we can see it in figure 2, which is 30x30 arcminutes, whereas figure 1 is 15x15 arcminutes (this picture comes from the astronomical images of Steve Quirk's Frog Rock Observatory). The cluster Pismis 24 is seen in this image, immediately below the brightest red knot of the emission nebula, right of center, asuming I have my berings straight. Massey et al. derive a distance modulus 12.03±0.14 mag using all of the cluster stars, and 11.99±0.05 using only the 6 O-class stars, so they adopt a true distance modulus of 12.0 mag, or 2.5 kpc (8150 ly). That's rather farther than earlier estimates around 1.7 kpc (5500 ly). The cluster is small & relatively unstudied.